Trinity Gilbert and Grace Martz model prom dresses at the Diva’s Den prom dress giveaway Saturday. Cassandra Sterling models a dress she picked up from the Lima Kiwanis Club prom dress giveaway, Saturday. LIMA — Cassandra Sterling is getting ready for prom. 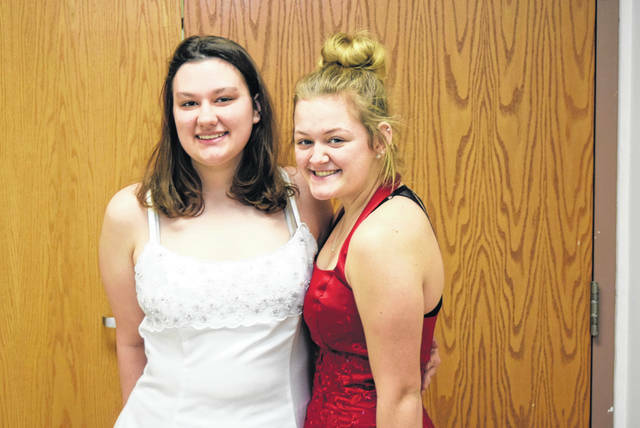 The senior, who attends Apollo Career Center, was one of the girls trying out prom dresses at the Lima Masonic Center, Saturday morning. 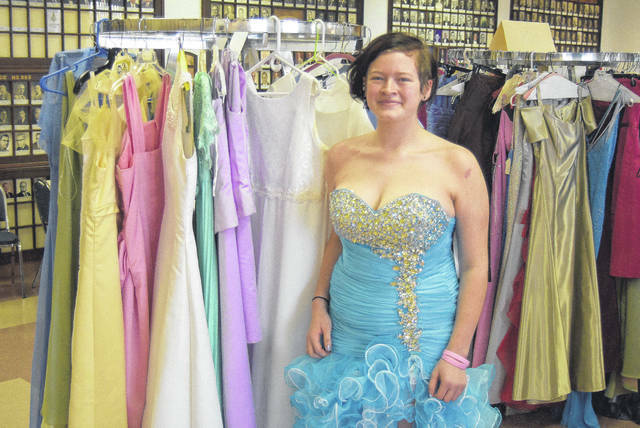 The Lima Kiwanis Club holds an annual prom dress giveaway in the hopes of recycling the dresses from previous years and giving other girls the chance to wear them. “I think it’s really great for girls that don’t have enough money to go out and buy a brand new dress. There are ones here that look brand new,” said Sterling. Trinity Gilbert and her friend Grace Martz, both from Fort Jennings, were checking out the dresses together. “I came here because I was looking for a prom dress, probably, like everyone else, nothing original. I think it’s really neat for people who probably can’t afford what other options there are,” said Gilbert. “It’s nice. It’s not for everyone, but my friends invited me, so it’s a great opportunity,” said Martz. Diva’s Den is the name of the event and it’s been organized by the Lima Kiwanis Club. The girls had 300 to 400 dresses to choose from. “There are lots of girls that maybe wouldn’t be able to go to prom without a dress. You find prom dresses cost $400 [for example], and we just feel this is a service we can offer them, and then they can take their money and buy shoes and jewelry. It’s a lot of fun to see the girls come with their mothers or with their grandmothers. Some girls come with their boyfriends so that they can make sure that the dress is something that their date’s going to like, so that’s a good thing too,” said Newland.